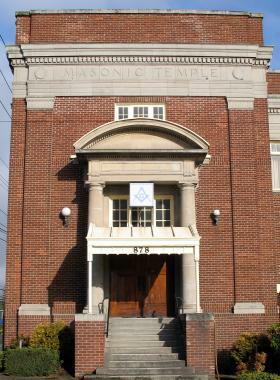 The Victory memorial Masonic temple was built in the early 1920's and was established by Bremerton pioneers such as: William Callow, Radm Luther Gregory, Adm. Robert Coontz, and Gen. Joseph Henry Pendleton. Two masonic lodges and multiple concordant non-profit Masonic organizations own and use the building. Pictures of the interior rooms are shown in the header above. Take a tour of the building by selecting the "information" menu option above. A map of the Bremerton, Washington location of the temple can be found by selecting the "Visit Us" menu option above. A schedule of the regular events that occur each month can be found by selecting the "Events" menu option above. You will find the Banquet Hall, kitchen, Lower Club Room on the lower floor of the temple. The Banquet Hall will support up to 300 for dinner. The Banquet Hall has an announcing system and wide-area computer tele-conferencing capabilities.The lower Club Room will sit 32. The kitchen area provides room for storing and preparing banquet breakfasts, lunches, and dinners. You can do your own cooking or cater your event. Several of the Rainbow Girls, Job's Daughters, and Masonic Lodges can provide catering services. The middle floor houses the two Lodge rooms. The largest can seat more than 120 on the side lines and with additional seating on the lodge floor, can seat at total of close to 200. The large lodge room has an announcing system and wide-area computer tele-conferencing capabilities. The smaller lodge room provides a more intimate venue for meetings of up to 60 people. The top floor holds the Upper Club Room and the Library. The Upper Club Room has its own kitchen and will accommodate up to about 60 seated diners. The library provides a place for small intimate business meetings of 10 or so around a large conference table.